First Line: Dear Mr. Taylor, Please forgive the formality. There's only one person whom Jack Taylor considers a friend, so when Ridge becomes ill, Jack cancels his trip to the United States. He's clean. He's sober. He's not even smoking cigarettes. But when a religious psycho begins sending him-- and only him-- clues that could prevent the murder of a child, Jack has no choice but to investigate. First stop: the police, where Superintendent Clancy's disgust for the former policeman makes him scoff at Taylor's insistence that there's a serial killer on the loose. Jack has no choice but to hunt the killer himself. I love Ken Bruen's Jack Taylor mysteries. They are lean, brutal howls of anguish and rage that sometimes read like poetry and at other times read like outlines. I normally do not care to read books about main characters who are alcoholics or drug addicts, but Jack Taylor is the exception. He rages against man's inhumanity to man. He is a wounded, soul-sick wreck of a man who came to be that way simply because he cares too much. I may not like Jack Taylor, but I do care about him. Bruen's Jack Taylor books are written in a sparse style that is filled with irony, sarcasm, and insights into modern Ireland. That these books are also filled with humor is something that may well pass many readers by if they do not pay attention. 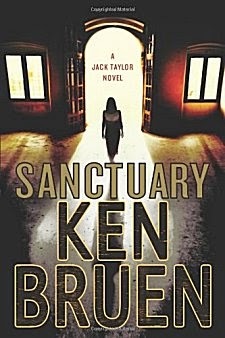 These books are dark and often brutal, and they aren't for everyone, but Ken Bruen is one of the very few writers who's ended a book with a scene that made me cry out in shock and horror and made me burst into tears. Very powerful stuff-- even the memory of that scene still ties me in knots. In Sanctuary, Jack Taylor learns something about what occurred in that scene that ripped such an emotional response from me, and he falls off the wagon of sobriety. After two lost weeks, he's down to ten drinks and one Xanax per day-- and he's finally ready to put an end to the killer who's still taunting him. The only thing in this book that didn't satisfy was the showdown between Jack and the killer. It seemed a bit perfunctory. But the book does end with questions that lead on to the next books in the series. I will read them all. Slowly. Because they're marvelous. And because I can't stay on Bruen's emotional roller coaster for extended periods of time. Jack Taylor is about as noir as they come, and although I may not like him, I do love him. Cathy - I can see why you feel the way you do about Bruen's work. As you say, his Taylor novels are sometimes both dark and brutal. Not everyone's cuppa. But they do have a way of drawing the reader in.